The Orange Laser Cory (Corydoras aeneus) (CW 010) is a peaceful Peruvian species that is also known to tropical fish keeping enthusiasts as the Gold Laser Cory, Orange Stripe Cory, or Peru Orange Stripe Cory. Orange Laser Coryadoras are found in the upper Amazonian rain forests of eastern Peru in the Upper Amazon, Marañón, Ucayali, Middle Ucayali rivers. 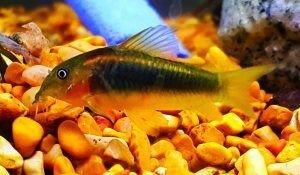 Although Orange Laser Coryadoras are imported as Corydora aeneus and are a recently identified species similar to the Green Laser Cory (CW009), they could actually be a variant or arguably Corydoras melanataenia. Only time and the scientists will tell. Regardless, the Orange Laser Corydora is a peaceful, secretive, shoaling species that do best in small groups when in an aquarium environment. In their native habitat they feed on worms, benthic crustaceans, insects, and plant matter. 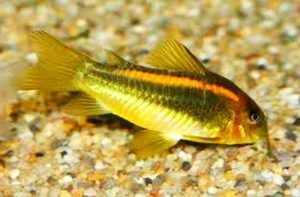 Orange Laser Corys are a yellow brown or greenish yellow body color with yellow fins. They posses a yellow to gold shoulder stripe that starts at the nape of the head and ends at the caudal peduncle. 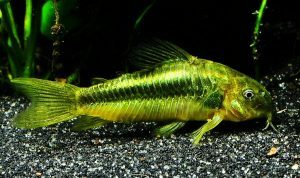 They have a darker green mid body band that runs along the entire length of the fish to the tail and a gold patch on the operculum. The tips of the fins in mature males are more pointed than the fin tips in females, which are more rounded. Females also grow larger and have fuller bodies when viewed from above than males. Orange Laser Corys are best housed in a densely planted tank of at least 30 gallon capacity with a sand or fine gravel substrate, a few smooth river rocks and overhead rockwork, and some bogwood or driftwood to provide them shelter. Tall Amazon Sword type or floating plants should be used to diffuse overhead lighting. Orange Laser Corydora do well in a community tank with other peaceful species of the same size such as Tetras, Rasboras and Danios but being a shoaling species, they do best with at least 5 or 6 of their own kind in a species tank or for breeding. Orange Laser Corys require clean water conditions and a moderate amount of current in their tank. A good filtration system and regular 25% to 50% water changes will keep them healthy and happy. Orange Laser Corydoras have been bred in an aquarium environment. Adult Orange Laser Corydoras do not guard their eggs. They are egg scatterers that spawn in open water and attach 1 or 2 relatively large sticky eggs to cleaned stones, plant leaves, or the aquarium glass. Females will lay anywhere from 10 to 40 or more (2 mm dia.) eggs per spawn which hatch out in 4 days at a water temperature of 78 °F. The fry become free swimming in another 4 days and are able to consume newly hatched brine shrimp, Moina , etc. Orange Laser Corydoras are easy to feed in an aquarium environment and will accept a wide range of commercial foods. Omnivore tablets, granules, quality flake foods, and live, frozen, or freeze dried bloodworms , white worms, grindal worms , brine shrimp, Daphnia , and tubifex are eagerly accepted. Although wild caught Orange Laser Cory specimens are occasionally available in tropical fish keeping shops, they are not common. They can be purchased online from a variety of sources when they are approximately .75″ to 1.5″ in size.